It’s a miraculous directorial debut from Greta Gerwig, full of rich emotion, specificity, and award-earning performances. Don’t you think they are the same thing? Love and attention? I’ve been beating my head against my dining room table for about an hour now, trying to find the words to put to screen about the wonders of Lady Bird. But what makes the film so wondrous is that there’s nothing obviously “wondrous” about it. It’s a thinly-plotted coming-of-age story about a restless teenage girl in 2002 Sacramento, California, the last place in California anyone ever thinks of (unless you, like me, miss the Williams/Divac Kings). She fights with her mother; she falls in love and has her heart broken; she acts out and then reconciles. As a synopsis, it’s simple, even ordinary. It’s a film we’ve seen countless times. 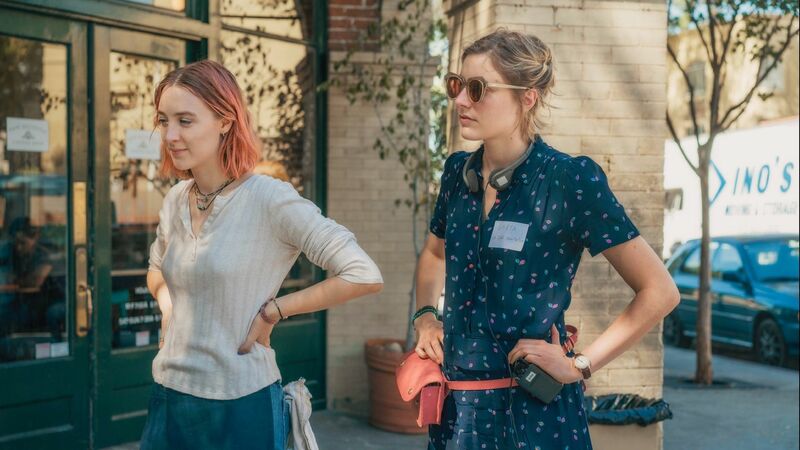 But the triumph of Lady Bird, the quasi-autobiographical first feature from acclaimed writer and indie actress Greta Gerwig (Frances Ha, 20th Century Women), is in everything that fits around that synopsis. It’s in how every moment of its fresh, impeccably constructed screenplay matters, from the first frame to the last. It’s in how the editing (from Nick Houy) keeps us gliding along, compressing a year in the life of our heroine to a brisk 94 minutes by showing us a series of loosely-connected vignettes, until those moments have steadily built on top of each other, layer by layer, and we can see the entire breathtaking mosaic. It’s in Gerwig’s attention to detail — not just the easy use of period music and fashions (God, 2002 is “period” now? ), but the verbal shorthand between her characters; Gerwig conveys that these were real people before we dropped in to observe their lives, and will continue to be after the movie’s over. 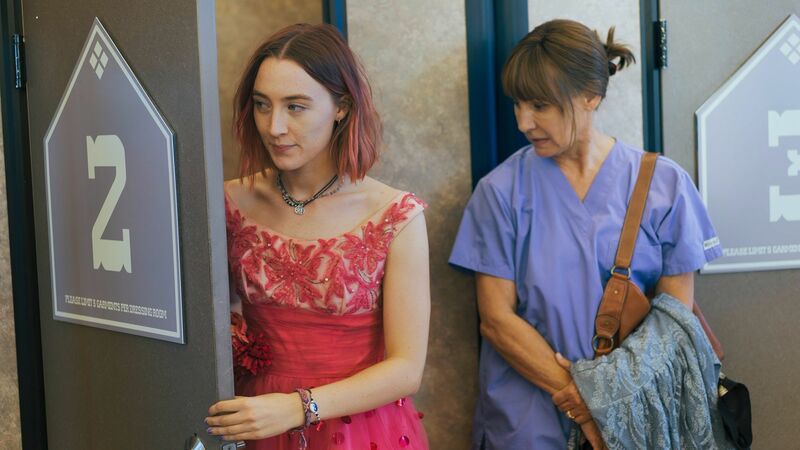 We first meet “Lady Bird,” as Christine McPherson (Saoirse Ronan) has styled herself, returning from a college visit with her mother Marion (Laurie Metcalf). Within moments, the temperature inside the car changes, as the wistful peace following the final chapter of the Grapes of Wrath audiobook descends into bitterness — a conversation that we intuit has already occurred a dozen times. Marion expects Lady Bird to attend a university close by, because they can’t afford to send her anywhere else, and she hasn’t shown the work ethic to get accepted anyway. Infuriated, the girl hurls herself out the moving car, and spends the bulk of the film sporting a pink arm cast — a symbol of the intransigence she and her mother both share. Being a teenager is hard, and it’s a wonder anyone survives it. Not only are you trying to figure out who you are and what kind of mark you can leave on the world, everything that happens to you and every decision you make is fraught with a disproportionate level of seriousness. In the “real world” of Lady Bird, beginning in the fall of 2002, the United States is in the early stages of the second Iraq War, and despite its near-constant presence on the television and newspaper front page, it barely registers on Christine’s radar. As far as she’s concerned, she has much more important things to deal with — like persuading her father (Tracy Letts) to help her apply to liberal arts colleges in New York behind her mother’s back, or gaining the affections of the sweet-natured Danny (Lucas Hedges), the lead in her Catholic school’s improbable production of Merrily We Roll Along. As the film skips forward, one event bleeding into another, connections form in surprising ways. In one scene Christine and best friend Julie (Danielle Macdonald, fantastic) lie on the floor with the camera directly overhead, illicitly snacking on communion wafers; later we’ll see a nearly identical shot, but this time they’re both crying, and Dave Matthews Band’s “Crash Into Me” is playing on the radio — an uncool song that the film is unafraid to have its main character love anyway, and that will become its own emotional cue even later in the film. Without spoiling much, the entire film is a master class in setup and payoff. Not with jokes or wink-y callbacks, but with old-fashioned character development. One of the many things Lady Bird has going for it is empathy. Gerwig presents a crystal clear picture of adolescent angst, unclouded by nostalgia. Christine’s flaws aren’t simply the idiosyncrasies of a world-changing heroine, but opportunities for growth. Similarly, her mother is no mere antagonist, but an anxious woman who’s just as tired of being “the bad guy” as Christine is of having to deal with her. Christine’s self-centeredness is rooted in shame — shame of her family’s 25-year-old “starter home” when compared to the McMansions of her friends; shame in being gangly, uncool, and bad at math. But Gerwig, looking back 15 years at what could have been her younger self, doesn’t let Christine off the hook, either; Marion may make mistakes as a mother, but there’s a deep well of emotional experience there behind her eyes that the younger McPherson is only just beginning to discover. Even the betrayals Lady Bird suffers aren’t nearly as cut-and-dry as they first appear, and every catharsis the family earns in the film’s final scenes is hard-earned. It’s hard to call Saoirse Ronan’s performance here a “star-making turn,” simply because by all rights she should be one already. Ronan’s got two Oscar nominations under her belt, including a Best Actress nod for 2016’s Brooklyn, and should easily pick up a third for her turn as Christine. Can she win? I’m not sure, with seasoned veterans Frances McDormand (Three Billboards Outside Ebbing, Missouri), Sally Hawkins (The Shape of Water) and Meryl Streep (The Post) in the hunt, but the 23-year-old actress is scary good here — earnest, clever, fierce, and without a trace of her natural Irish brogue. Metcalf, too, is firmly in the awards conversation on the supporting side, and Letts, Macdonald, and Hedges all make lasting impressions. Timotheé Chalamet, himself on the verge of a Best Actor nomination for Call Me By Your Name, is exquisitely insufferable as the brooding, faux-woke Kyle, who catches Lady Bird’s eye at a party but spends most of his screen time reading A People’s History of the United States. After making a surprising (to Christine) personal admission, he attempts to deflect via its relative unimportance compared to the war in Iraq; “Different things can be sad,” she replies. “It’s not all war.” By the time Lady Bird reaches its beautifully inconclusive ending, Christine’s journey of self-discovery has led her to the only worthwhile place it can: discovering not just what exists outside of the world you know, but outside of yourself. That makes Gerwig’s achievement here difficult to describe, but a joy to watch.